RUSSIA: Police Arrest Activists At St. Petersburg Pride Rally - Joe.My.God. 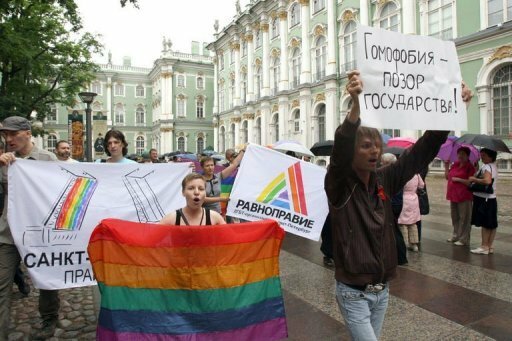 Five activists were arrested today at small gay pride rally staged in St. Petersburg, Russia. About two dozen gay and lesbian activists gathered in the tourist-packed courtyard of one of the world’s most famous museums, founded in 1764 by Catherine the Great, carrying banners and chanting “Homophobia is the country’s shame.” One of the organisers, Maria Efremenkova, said the Russian government did nothing to protect gays. “You do not notice us and (you) violate our rights and freedom,” she said. Gay activists have been trying for years to get permits for rallying, but to no avail. The organisers of the rally in St. Petersburg were refused five locations, they said. Homosexuality was punishable with jail terms in the Soviet Union and though Russia decriminalised homosexuality in 1993, intolerance remains very widespread. Polls have shown more than 80 percent of Russians see homosexuality as immoral. Although today’s protest was not publicized in advance, a group of ultra-right Russian nationalists showed up and attempted to stage an attack. They were arrested as well.